Making sure that kids brush and floss their teeth every day is a fantastic way to keep your child’s smile healthy, but did you know that what they eat can impact their dental health? 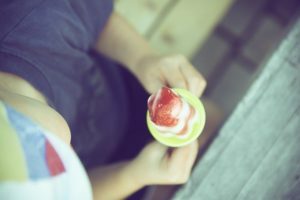 While a few foods might be obvious, there are some foods that are surprisingly hard on kid’s teeth, and many parents are unaware that what they give their kids for snacks may be bad for them. What kids eat can harm their teeth, so understand which snacks to avoid and a few great alternatives. Sometimes nicknamed “white foods”, white rice, white rice, white bread, plain pasta and other simple carbs could lead to tooth decay, since they quickly break down to simple sugars. Soft white bread and rolls are particularly harmful; they’re gluey enough to adhere to your child’s teeth. It’s hard to avoid giving kids a sweet treat occasionally, but keep in mind that snacks like cookies, candy, cake, and other goodies are hard on teeth. Over time, they can cause cavities so when your littles ones enjoy a sweet snack, be sure they brush afterwards! If they can’t brush right away, even swishing with water will help rinse away some cavity-causing bacteria until they can brush. Those neon, sugary drinks are really rough on kid’s teeth, not only all the sugar but the harsh dyes as well, so it’s best to avoid those whenever you can. Sweet drinks can also include fruit juices, which can be very surprising for many parents. Fresh fruit juice is healthy, but too much of the sweet stuff can be harmful, especially those that are more acidic like orange juice or pineapple juice. Try diluting those juices with water to reduce the sugary impact. Any kind of sticky snack that can be easily trapped between kids teeth can cause problems over time. Raisins and other dried fruit are great, healthy treats that kids love, but keep in mind that their stickiness can cause problems if they sit between teeth for too long. Remind kids to brush or swish water after snacking on these. Foods that contain starch include pretzels and potato chips can cause tooth decay. Starches, like simple carbs, can stick to the teeth (or between teeth) so try to keep those salty snacks to a minimum. What are some good alternative snacks for kids? Keep your child’s teeth healthy and strong by avoiding or greatly reducing “bad” snacks, and instead introducing them to teeth-friendly snacks like fruit, vegetables and cheese. What kids eat can hurt harm their teeth, but with a few small changes, your child will have a healthy and happy smile for years to come. Need more information on foods to avoid? Ask your pediatric dentist to give you a list of foods and drinks to avoid.